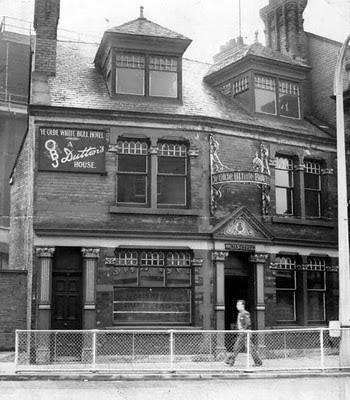 This is Ye Olde White Bull on Salford. Often referred to by Blackburnians as 'The Little White Bull' or even 'Little Bull' so as not to confuse it with the nearby, larger (big) White Bull Hotel which is also on Salford. The pub in the top photo, was known to some locals as 'Tom's Inn' because it stood in the shadow of Dutton's Brewery (Thomas Dutton being the founder). I'm not too sure when the older pub was built, but it was very probably late in the 19th century, as I've seen older photos (c1880's) of this location and the pub isn't in them. 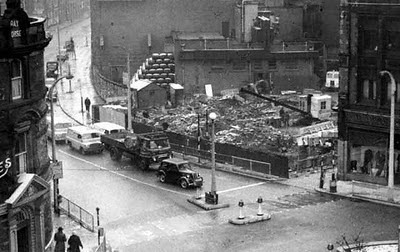 I do know when the older pub was demolished though, it was in 1959 (the second photo shows the demolition site). 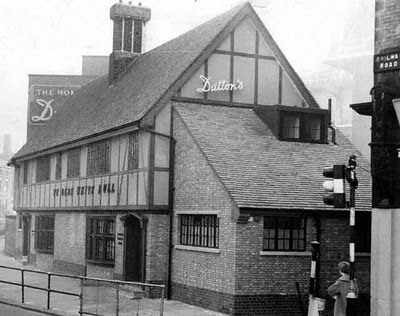 Soon after demolition, Dutton's then built the 'new' Ye Olde White Bull on the same spot. It opened its doors in October 1960 and on opening, the punters had a choice of drinking their beer from the traditional pint and half pint glasses, or having their tipple in, specially produced for the opening, glazed tankards (see the bottom photo). 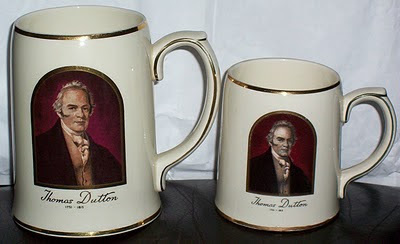 According to the Evening Telegraph, the attractive tankards proved to be very popular with the regulars and within a month of opening, the majority of them had been pilfered, taken home as souvenirs. The 'new' pub built in 1959-60, still stands and it kept its original name until refurbished in 1979, when it re-opened as 'The Brewers Arms'. It changed name once again in 1998, when it became Pitchers Bar, but to many, it will always be The Little Bull. Port and sherries, 1d measure. On the back of the price list is the interesting note "We have introduced the use of Imperial Measures for the serving of Wines and Spirits in this lounge". there follows a potted history of the Imperial measures and of the use of the term "gill" which was normally taken to be one quarter of a pint but where milk and beer were concerned, it referred to half a pint! Not confusing at all if you were a beer man! 3/9 (Threee shillings and ninepence) 18p. Great fun to call those days to mind! By the way, “Ye” should be pronounced “the” not “yee”, The modern letters 'th' replaced two earlier letter thorn and eth. One was pronounced as the 'th' in 'the' and resembled the letter 'y'. as the 'th' in 'the' and resembled the letter 'y'.